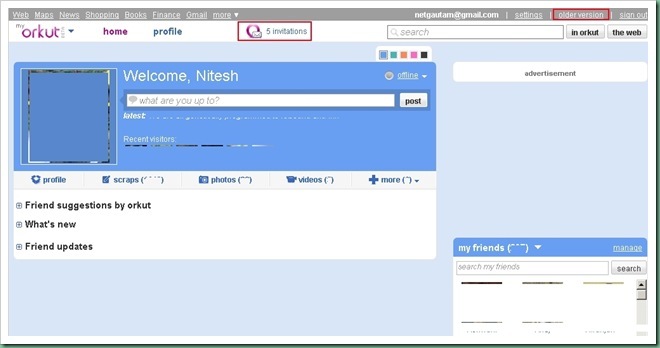 Google is pushing more and more invitations for people to switch to new Orkut interface which can be called as new version as it is very different than the original version. New Orkut is more of AJAX than plain HTML. It appears as if HTML is reserved only for the different pages (like Profile, Scrapbook etc.) and that is sometimes frustrating enough to dislike excess of AJAX which of course takes time to load in different parts of page wherever so many apps (of course AJAX again) are already integrated. In this case the beauty of AJAX is overshadowed by the wait for it to load in different parts when a specific user activity takes place than the main purpose served by it for making the user interface simpler and easier. I wonder if very soon they will drop term new Orkut and calling original Orkut as Old Orkut. Though it doesn’t sound much different but it can make quite a lot of difference specially when in today’s web-world, no one would like to stick with a website tagged as Old. 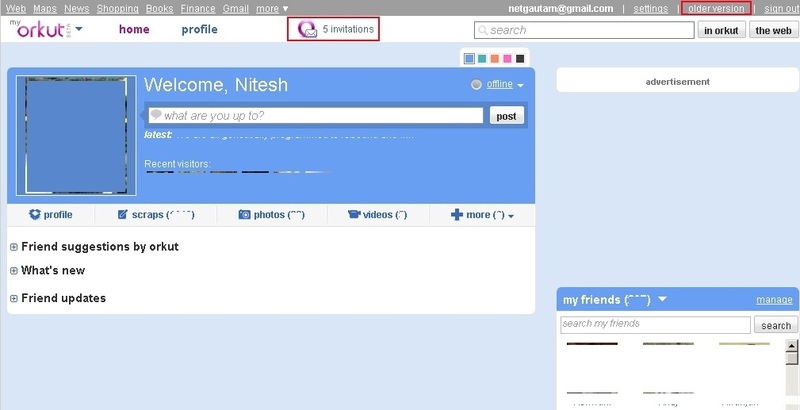 As of now, new Orkut interface needs lot of improvements. Invitation can be sent to only those who are in friend list. can u plz send me new orkut req.? Please send me new orkut..
plzzzzzzzz send me new orkut request………i wanna enjoy the new version too……..
PLIZ SEND ME NEW ORKUT INVITATION . Plz send me the great & great orkut. waiting 4 this from depth of my heart. plzzzzzzzz send me new orkut requestâ€¦â€¦â€¦i wanna enjoy the new version tooâ€¦â€¦..
could u send me the new orkut request.plzâ€¦â€¦..
could u send me the new orkut request.plz……..
could u send me the new orkut request.plzâ€¦â€¦â€¦..
could u send me the new orkut request.plz………..
i too want to use new orkut plz. send me an invitation for it. thanks. plz plz plz an you send me the new orkut request..
hi i m krishna gautam. plzzzzzzzzzz send me d new orkut request……..
PLSSSSSSSSSSSSSSSSSSSS SEND ME NEW ORKUT REQ. can you please send me a new orkurt request please. hi friends can you plz invait new orkut plzzzzzzzzzz. please send me a new versin on orkut. pls sent me new orkut request. can you send me new orkut request pls. can u send me new orkut invitation……………..
can u send me new orkut invitationâ€¦â€¦â€¦â€¦â€¦..
hey dude send me new orkut pls..
i want to join new orkut…hw can i get it? HI.HOW CAN I GET NEW ORKUT?PLS CAN U SEND ME NEW ORKUT REQUST PLS. I want to use my orkut profile in new orkut so plz send me a new orkut. can u plese send me the new orkut invitation. I also want to upgrade my orkut.